If the subtropical north presents itself in a diverse forest and mountain landscape, inspire in the south breathtaking steep coast sections with picturesque small bays and wide, fine sandy beaches. The variety of the island is also reflected in the extremely rich sport and leisure offer. Due to the best climatic conditions, with average temperatures of 20 ° C in winter and 25 ° C in the summer months, Tenerife is an 'island of eternal spring', an ideal destination for golfers in particular. In the sunny south-west of Tenerife lies the main holiday resort of Tenerife: Playa de Las Americas and the adjacent Costa Adeje and Los Cristianos. Here visitors can expect a lot of sun and a good tourist infrastructure with a wide range. There is an abundance of shops, bars, restaurants, pharmacies, doctors, banks and much more. The bathrooms are equipped with hair-dryers, the sockets have 220 V.
Kitchen: ceramic stove top, baking oven, dish-washer, freezer, microwave, electric-kettle, toaster, egg cooker. Living-room: leather sofa (for 3 and for 2) with armchair, flat-screen TV with DVD-Player/Recorder, digital satellite TV (you can receive over 500 programs), mini hi-fi system with radio and CD-player/MP3-Player. Outside-area: private pool with inside light, 4 garden-couchs, 2 blinds, parasols, gardengrill, pretty small private garden with palm trees and lemon-tree. All bedrooms have an own TV, clock radio and wall closets. Thank you Sven. We were very happy in your house and very much enjoyed the beautiful views over the sea, the big terrace and barbecue, the new kitchen with its good coffee machine and the comfortable beds and TVs with many international channels in every room. Everything has been carefully thought for your comfort and a good holiday. There are also some Tenerife Travel books, maps and restaurants recommendations which were greatly appreciated. A few minor things could still be improved and would have made our stay even better but this did not affect our holidays at all. The outside pool is great but a heated pool would have been better as it was quite cold so we did not use it much. We never used the garage as it is narrow, on a hill and quite difficult to get in. You definitely need a car for this house as it takes about 40 mns to walk down to the beach and walking back to the house is difficult as the hill is very steep. It would be good to have a door between the garage and the house as it can get very noisy with the neighbours and one can smell the car fumes into the house. The floor was not so clean and the front door is very difficult to open. One of the dining rooms blinds failed and no one came to fix it as promised. The person who came to give us the house keys when we arrived on the first day was in a rush (as he had to go and meet many other guests) and not very welcoming, he handed us the house keys but did not explain or show us anything. There is a safe but we could not use it as we were not given the key for it. They forgot to provide some bed sheets for the third bedroom but it was sorted out very quickly as I contacted Sven directly who is very professional, kind and efficient and always replies quickly. All in all, I would highly recommend this house. We had a great time and we are hoping to come back soon. Many thanks for the nice review. I am glad, that you felt well and you had a fantastic time in our house. You are welcome if you want to come back! The only reason I have given 4/5 stars is because on arrival the swimming pool was very green with algae. However between the house keeper and Sven the owner, the problem was sorted quickly but sadly it did mean we couldn't use the pool for the first 36 hours. Being really picky I would say the outside area is looking a little tired as one of the sun loungers is broken, and the area could do with a lick of paint, but as I say, I'm being picky. The rest of my comments are however, highly positive. For us, a family of 2 adults and 4 children, 3 bedrooms with very comfortable beds, 2 bathrooms both with a bath and shower, 3 toilets and a dishwasher was just perfect! The house was very clean and spacious. We always book a villa for our holidays and I can safely say the beds here were the most comfortable we have ever slept on, on holiday. We arrived at 11pm on Friday 19 August 2016 for a 2 week stay. You would expect to vacate the house around 11am on the day you fly home but as we were not flying back until 10pm Sven allowed us to stay until 6pm at no extra cost. This was an absolute bonus as it meant that we could still go to the beach, out for lunch, and have a final swim in the pool before heading off to the airport, rather than waste the last day hanging around just waiting to fly home. It is around a 7 minute drive to the coast and in our opinion near some of the best beaches. Adeje, fanabe and duque were our favourites. It is in a quiet location and extremely nice to sit out on the terrace to have a BBQ in the evening overlooking the surrounding area and watching the sunset. Meals out in the Adeje area are good value and of reasonably good quality (much better than Spain) Siam park and Loro park are great attractions but do book your tickets in the UK to save lots of money. A 2 hour boat trip out of Los Cristianos was half the price of the trips from Adeje and we saw around 6 dolphins and countless whales, this was a fantastic trip. A drive up El Teide is also a must. However, for us, having children, the house with a gated lockable gate on the pool was priceless. My 5 year olds fingers were not strong enough to turn the key to unlock it. Many houses advertised on this website show the pool but do not mention it being gated. Imperative as far as I am concerned. Thank you Sven we had a lovely time staying in your house, and yes I would recommend it to others. I am very happy to get such a nice and detailled feedback. Many thanks for the nice feedback. Regarding the pool, I apologize for the green pool the first 2 days, but we solved this problem immediately, the pool cleaner came also on saturday and sunday to get the water clear. You are welcome at any time, if you want to come back. We have enjoyed our stay very much. We (Dutch family; kids age 12 and 16) stayed for two weeks in the winter time. The house is luxerous and the views are stunning. It's a pleasant place to relax and enjoy a combination of (electronic) comfort inside and the huge terrace outside. The inventory of the house and the spacious setting give the feeling that it's all designed by a clever young man with a good feeling for practical furnishing. As an example: The route description to the house started to give a feeling of 'Deutsche grundlichkeit'. In the house everything worked well and the large folder with information was very useful. For those seeking a place to rent: It's may not the cheapest place, but it's more than worth the money. Thank you very much for the good review. You´re welcome at any time, if you would come to Tenerife again. Wir waren bereits zum zweiten Mal dort und auch dieses Mal mit unserem Aufenthalt höchst zufrieden. Besonders positiv ist die neue, hochwertige Küche hervorzuheben, die keine Wünsche offen lässt - sei es der Induktionsherd, die Spülmaschine oder das vorhandene Inventar. An alles ist gedacht! Vielen lieben Dank für die tolle Rückmeldung. Wir freuen uns sehr, das Sie sich wohl gefühlt haben. Sie sind jederzeit herzlich willkommen wenn Sie wieder kommen möchten. Wij werden opgewacht met de sleutel van de villa en we kregen een goede rondleiding. Vlug naar de grote supermarkt, wagen in de garage en via een trap sta je in de keuken. De villa heeft alles aan comfort en luxe, er ontbreekt niets. Nieuwe keuken, grote slaapkamers, grote badkamers. Het verlof gaat van start met een glaasje wijn en tapas op het terras met... zicht op zee! Een aangenaam zwembad en goede strandzetels. De villa heeft de ganse dag zon en 's avonds een mooie zonsondergang. Enkele mooie uitstappen : Basiliek Candelaria, Playa de San Roque en eten in restaurant bij Pepe. Vragen naar vis van de dag. Prachtig uitzicht met rotsen in de zee. Ook mooi Garachico eten in restaurant La Perla. In een klein straatje naast de kerk. Een echte aanrader! Wij kiezen voor de echte Spaanse restaurants, mensen zijn altijd super vriendelijk en niet opdringerig. Ons bezoek aan Tenerife was 22 jaar geleden. We hebben genoten en dan vooral in een super villa met uitzicht op zee!! Dank u voor de mooie recensie. Ik ben blij dat u een fantastische tijd hebt gehad. U bent van harte welkom als u terug wilt komen! Vollausgestattete und saubere Unterkunft, mit eigener Tiefgarage in der Villa (TOP) mit Blick aufs Meer. Allerdings wäre eine Abtrennung (Tür) von der Garage zum OG sinnvoll, denn nicht jeder steht auf Fahrzeug-Ausdünstungen. Es sind nicht alle Wandsteckdosen (im Bereich Fernseher/Surroundanlage etc.) funktionsfähig - am 1. Tag gemeldeter Defekt wurde während des Aufenthalts leider nicht behoben - allerdings sind ausreichend Mehrfachsteckdosen zur Verlängerung im Haus. Schlüsselübergabe/Einchecken durch die Vertretung aus dem Übergabeteam war kurz, ausreichend und einfach (wenn auch etwas "emotionslos"). Alles in Allem aber empfehlenswerte Unterkunft. Vielen Dank für Ihre Rückmeldung. Wir freuen uns, das Sie sich wohl gefühlt haben. Leider ist unser Elektriker krank geworden, so daß die Steckdose erst nach Ihrer Abreise repariert werden konnte (ist mittlerweile erledigt). Sie sind jederzeit herzlich willkommen wenn Sie wieder kommen möchten. 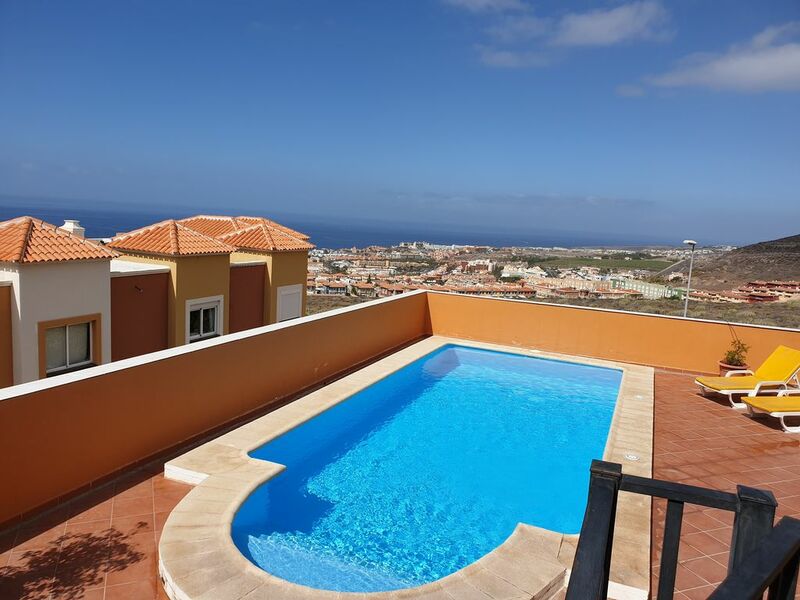 The villa is located upside of the Costa Adeje with a wonderful view over the whole coast and over Playa de las Americas. While viewing above the Atlantic, you can see casually also the neighboor-island La Gomera. In the evenings you have a fantastic view over the sea of lights from the city. But also the view to upstairs is it worth: You can enjoy the panorama over the mountains to the Roque del Conde. The location is quiet and although central, because you can get in a few minutes with the car to all beaches of the Costa Adeje and Las Americas. Also to the pictoresque harbor of Los Cristianos is not far away. A new attraction is the SIAM-Parc and the Aqua-Parc Octopus. Las Americas is the tourist center from Tenerife with scores of restaurants, bars, bancs and sports activities. The climate is mild all over the year. Die Preise oben gelten für maximal 4 Personen. Für die 5. und 6. Person (altersunabhängig) kommen jeweils 10 EUR pro Tag hinzu. Die Endreinigung kostet einmalig eine Tagesmiete. Bei einer Anreise zwischen 22.00 Uhr und 8.00 Uhr berechnen wir für die Schlüsselübergabe einen Nachtzuschlag von 20,00 €.